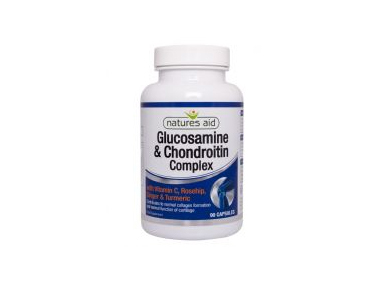 Order Natures Aid Glucosamine & Chondroitin Complex from the Online Health Food Store UK. Buy Natures Aid Glucosamine & Chondroitin Complex - 90 capsules and other quality Joint & Bone Support safely online in the UK. Glucosamine & Chondroitin Complex with Rosehip, Ginger, Turmeric and Vitamin C.
Take 1 -3 tablets a day with food. Do not exceed the recommended intake. As official Natures Aid stockist in the UK, we sell quality Joint & Bone Support to customers throughout the UK in England, Wales, Scotland and Northern-Ireland. Where to buy Natures Aid Glucosamine & Chondroitin Complex safely online? Shop at the Online Health Food Store if you are wondering where you can buy Natures Aid Glucosamine & Chondroitin Complex - 90 capsules safely online in the United Kingdom. Our Health Shop is located in the UK and our award-winning independent has been serving customers in England, Wales, Scotland and Northern-Ireland since 1976. You can buy our Natures Aid nutritional supplements and other quality Joint & Bone Support online and we post out orders to any UK address. Glucosamine & Chondroitin Complex - Natures Aid Glucosamine & Chondroitin Complex - 90 capsules in Joint & Bone Support and Herbal Remedies, Tinctures & Supplements.